, son of Drusus and of Antonia the virtuous niece of Augustus, inherited the excellent qualities of his mother. Tib.erius, who was his paternal uncle, adopted him, and he was gradually raised to the consulship, the twelfth year of the Christian tera. When Augustus died, he was in Germany, where the soldiers would have raised him to the empire, had he not declined it. He recalled the rebellious to their duty, defeated the Germans under Arminius, and retook a Roman eagle which the Marsi had kept from the defeat of Varus. Being recalled to Rome, he obtained the honours of a triumph, and was appointed commander in the East, whither he returned soon after, to quell the enemies of Rome in that quarter. He was there so successful, that he defeated the king of Armenia, and placed another on his throne. But the splendor of his victories is supposed to have cost him his life; for Tiberius became jealous of him, and if he did not actually poison him, as many thought, contrived to wear out his life with fatigue and vexation. He died at Daphne of Antioch, aged 34, in the 29th year of the Christian sera. His widow, Agrippina, by whom he had nine children, received his ashes with sincerity, as well as solemnity of grief, in which all Rome, except the tyrant, deeply partook. One of his sons was Caligula, who proved so dreadfully unworthy of his excellent father. 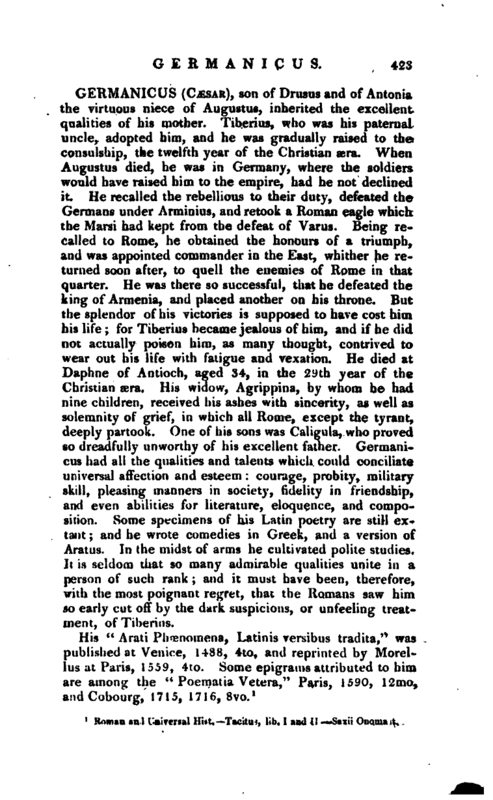 Germanicus had all the qualities and talents which could conciliate universal affection aod esteem: courage, probity, military skill, pleasing mariners in society, fidelity in friendship, and even abilities for literature, eloquence, and composition. Some specimens of his Latin poetry are still extant; and he wrote comedies in Greek, and a version of Ararus. In the midst of arms he cultivated polite studies. 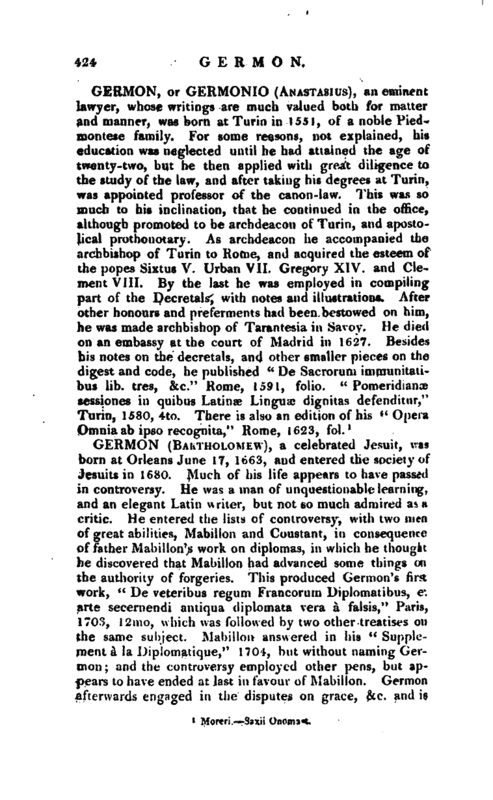 It is seldom that so many admirable qualities unite in a person of such rank; and it must have been, therefore, with the most poignant regret, that, the Romans saw him so early cut off by the dark suspicions, or unfeeling treatment, of Tiberius. Roman and Universal Hist.—Tacitus, lib. I and II—Saxii Onomast.